This year, we mark 6 years since the nuclear meltdowns and radiation releases at the Fukushima Daiichi nuclear reactors. That nuclear catastrophe resulted in the forced evacuation of tens of thousands of people, and many will never be allowed back to their homes. The disaster is still ongoing. At last estimate, the Japanese Government says it will take decades to resolve the crisis and the cleanup and compensation costs will cost an estimated $180 billion. In the wake of the Fukushima meltdowns, the U.S. Nuclear Regulatory Commission created a task force to look at lessons that should be applied to nuclear plants in the U.S. To date, many of their findings and recommendations have not been heeded, leaving us vulnerable to nuclear catastrophes of our own here in New York. In Upstate New York, we are particularly vulnerable because we have three “Fukushima-style” nuclear reactors on the shore of Lake Ontario. The upstate nuclear reactors have been struggling financially, and despite growing opposition, NY Governor Cuomo has secured new subsidies to keep them open. These subsidies will go into effect on April 1, 2017, at a cost of approximately $7.6 billion over the next 12 years. The subsidies for these dangerous reactors will be paid for by all electricity customers in New York, unless we are successful in stopping them. Find out more about each reactor below. >> Read about a similar fire at the Indian Point reactors, after which Governor Cuomo held a press conference, saying "This was a relatively minor situation, but when you're talking about a nuclear power plant there are no really minor situations." Mark I reactors like FitzPatrick have relatively small containment structures, making them especially vulnerable to large-scale accidents. In 1986, Dr. Harold Denton, an official at the Nuclear Regulatory Commission (NRC) acknowledged they had as high as a 90% chance of failure if challenged by severe accident conditions. FitzPatrick is the only Mark I in the US that does not have a hardened vent system as was recommended by the NRC. The venting plan at FitzPatrick, in the case of an accident, is to let radiation, gases, and steam vent into a nearby building, where it is expected the doors will blow off, releasing radiation at the ground level. Alliance for a Green Economy has been calling on the NRC to address this dangerous venting plan since 2011, but the agency continues to allow the plant to operate without a hardened vent. In 2016, Entergy requested an 18-month extension for the required installation of a new vent and this request was granted, putting off this important fix, yet again. Most of FitzPatrick's spent fuel is kept in a fuel pool on site. Just like the reactor core itself, spent fuel pools must be kept cool with a constant supply of water cooled by electricity. In Boiling Water Reactors like FitzPatrick, these pools are high in the air near the reactor core, making them vulnerable to exposure from leaks or to explosions caused by problems within the core. Institute for Resource and Security Studies estimates that a spent fuel pool fire could render 33,000 square miles uninhabitable. New York State is 55,000 square miles. In 2016, the New York Independent System Operator (NYISO) found that FitzPatrick could close with no need for additional plants to be built for replacement. Our analysis also found that FitzPatrick could be replaced with energy efficiency and renewable energy, while providing worker retraining and wage support and property tax replacement for municipalities at lower cost than subsidizing the continued operation of FitzPatrick. 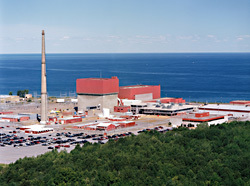 FitzPatrick is currently owned by Entergy Corporation, but is in the process of being transferred to Exelon Corporation, which has agreed to buy the reactor if the state nuclear subsidies go into effect. Entergy is also the owner of the Indian Point nuclear reactors in Westchester, New York, which will be closed by 2021. In 2015 the Union of Concerned Scientists singled out Entergy for special mention since 3 of the year’s 10 Near Misses occurred at Entergy plants: Indian Point Unit 3, Pilgrim Nuclear Power Station, MA and River Bend Station, LA. In addition, 2/3 of the safety violations cited were given to Entergy reactors. Ginna is the oldest reactor of its type in the US and one of the 8 oldest reactors in the world. No reactor in the world has made it to 50 years of age before shutting down, and Ginna is 47 years old. Ginna was slated to close in April 2017, but will be kept open through subsidies. The NRC estimates that a core meltdown at Ginna could cause 20,000 cancer deaths and 1,400 early fatalities within 12.5 miles of the plant. Ginna is currently receiving temporary subsidies from customers of the utility Rochester Gas & Electric, under a two-year agreement that will end on March 31, 2017. This agreement was designed to preserve electricity reliability in the region until the utility could finish building a transmission upgrade that will make Ginna's continued operation unnecessary. In 2016, the New York Independent System Operator (NYISO) found that once that upgrade is finished, Ginna could close with no need for additional plants to be built for replacement. Yet, under a new "Clean Energy Standard" policy, all New Yorkers will now be forced to subsidize Ginna. Ginna is owned by Constellation Energy Nuclear Group (CENG), which is jointly owned by Exelon Corporation and Électricité de France (EDF). Exelon holds the majority stake in the company. In 2012, Constellation (which was purchased by Exelon) was fined $245 million for manipulating energy markets in New York. Exelon is the largest nuclear owner and operator in the U.S. and is notorious for fighting competition from renewable energy. For example, in 2012 Exelon was kicked out of the American Wind Energy Association because of its active opposition to renewal of federal tax credits for wind energy. Nine Mile 1 is one of the two oldest operating nuclear plants in the US and it is showing its age. In 1997, severe cracks were discovered in the shroud surrounding the reactor. 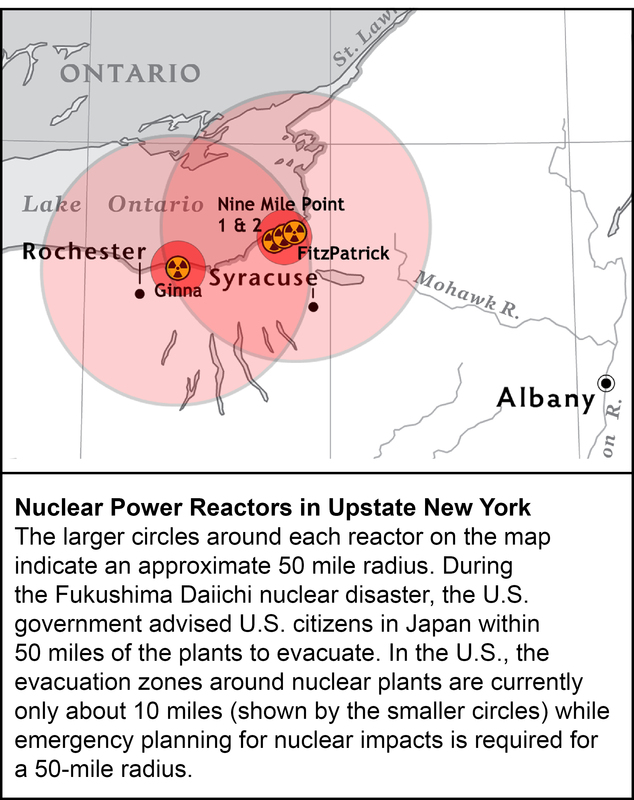 Nine Mile 1, like FitzPatrick is a Mark I Boiling Water Reactor, which have been known to have flawed containment designs since the 1970s, when scientists at both the Nuclear Regulatory Commission (NRC) and GE raised concerns that their containment structures would not successfully withstand a nuclear accident. In 1989, the NRC advised Mark I operators to install a hardened vent, which was to be used as last resort if an accident occurred to relieve pressure and prevent hydrogen explosions within the reactor. In March of 2011, the Mark I design and the venting system were put to the test during the Fukushima Daiichi nuclear catastrophe. In each of the three reactors that were online at the time of the accident, the containment system failed. Nine Mile 2 is a Mark II Boiling Water Reactor, which is a close design to the Mark I reactors and suffers from the same containment design flaw. Most of Nine Mile Point's spent fuel is kept in fuel pools on site. Just like the reactor core itself, spent fuel pools must be kept cool with a constant supply of water cooled by electricity. Institute for Resource and Security Studies estimates that a spent fuel pool fire could render 33,000 square miles uninhabitable. New York State is 55,000 square miles. Even though Nine Mile Point will receive the lion's share of New York's nuclear subsidies, which were approved in order to prevent unprofitable reactors from retiring, Exelon has never submitted a retirement notice for either reactor at Nine Mile Point. There is no public financial evidence to justify subsidizing either reactor. Ginna is owned by the same owners as Nine Mile Point: Constellation Energy Nuclear Group (CENG), which is jointly owned by Exelon Corporation and Électricité de France (EDF). See above for more detail about these companies. There is an active campaign right now to stop the subsidies for these reactors and phase them out.